MW Mobile Blog: Guantanamo in da moonlight? 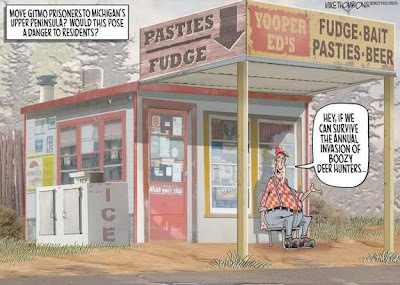 "How about Michigan, for a change, solving a problem for the U.S. government, instead of the other way around?That's one way to look at an idea floated recently by former Gov. John Engler to offer the Upper Peninsula, already home to a dozen state prisons, as a place to move the 200 or so enemy combatants and terror suspects now housed in a camp at Guantanamo Bay, Cuba. President Barack Obama intends to close Guantanamo, just as soon as the administration figures out what to do with the prisoners there, a knotty problem considering they may include some of the most dangerous people on the planet..."
"Former Michigan Gov. John Engler has an interesting idea to bring some revenue into Michigan: Turn the UP into Guantanamo Bay North... Not an idea that Michigan political leaders are likely to get behind." "Former Michigan Governor John Engler suggested last week that the more than 200 prisoners currently housed at the soon-to-be-closed Guantánamo Bay, Cuba prison be relocated to to the Upper Peninsula. We certainly could use the money and people actually moving into Michigan to live would be big news. Which would be fine until winter arrived, when a UP prison would run afoul of the Obama Administration's prohibition against torture"
Hey - If it moves some money and jobs to the UP... why not, eh?